Yesterday was the one year anniversary of the earthquake in Haiti. One year later, SIFAT continues to install water purification systems to provide clean, safe drinking water to a country torn apart by the devastating earthquake, hurricane and cholera outbreak. Can you imagine being thirsty, but knowing the water you drink may be contaminated with cholera? 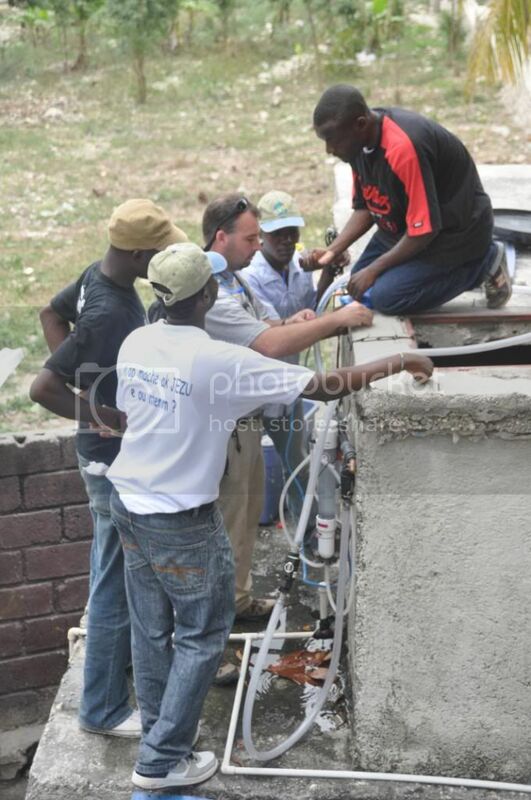 SIFAT teams are making a difference by installing purification systems and training local Haitians how to do maintenance and upkeep. Now, they have hope! Hope that life is looking up…hope that they will not only survive, but also thrive! In 2011, Bahamas Habitat will provide air transportation for 12 SIFAT teams. As I write,Â SIFAT graduate Trey Reed is in Cape Haitian, which isÂ now the area with the highest cholera outbreak in Haiti. SIFAT is working with medical clinics, partnership organizations and SIFAT graduates to install water systems where they are most needed. In May 2010,Â SIFAT taughtÂ 15 Haitian community leadersÂ at ourÂ Alabama campusÂ during a three-week intensive session on practical skills,Â such as food production and water purification. We have made a 3-year training commitment with approximately 70 Haitian community leadersÂ to holdÂ seminars and provide technical support.Â To accomplish this, Dr. Byron Morales from Ecuador has joined our staff to conduct seminarsÂ periodic training sessions in Haiti with these community leaders. Your continued prayers and support are needed now! To donate to our work in Haiti, please designate “Haiti” on your check. If you are donating online, e-mail hurttc@sifat.org with the subject online donation for Haiti, and we will make sure your donation is applied to our Haiti fund.